The sad reality of city driving is that getting there is only half the battle. You sit for an hour on I-35 wishing for the sweet release of death, hoping you’re on time. You made it! Until the fact that you have to find a parking space (and there isn’t one) makes you annoyingly late. Luckily, new navigation systems being may help you drive straight to an open space. German auto supplier Robert Bosch GmbH is one of many suppliers who are shifting their priorities towards developing the latest technology in autonomous electric cars. Part of that strategy involves beefing up their navigation systems with connected mapping and high-definition maps, reports Automotive News. Real-time data on where parking spots are available would be crowd-sourced from cameras and sensors on vehicles, which will record open parking spots. A shared cloud network would record and serve the locations of those open spots to drivers who need parking. 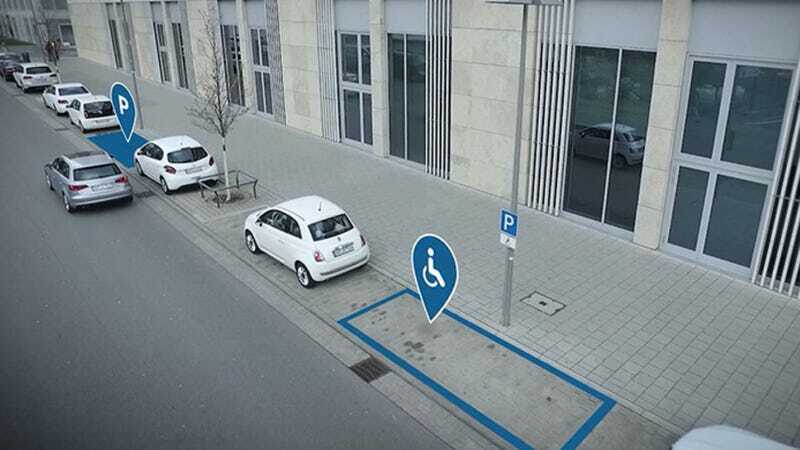 While you’ll have to drive yourself to those spots for now, being able to let a car find its own parking space is a clear next step in autonomous vehicle development. A parking spot finder is an idea so good that our own Raphael and Mike pitched an app like it—Parkr—on Cars vs. America. Only they didn’t make it first, so we won’t have to eat them with the other rich folks when the revolution comes. Bosch’s Parkr-like service is already about to jump out of its pilot phase to a test run in 20 cities, including Boston and Los Angeles. Bosch also recently purchased a 5 percent stake in navigation company Here, which is another part of their jump to meet the needs of autonomous cars. They hope to use similar sensor-sourced technology to update maps in real-time with data on things like traffic. Because cars can’t drive themselves yet, Bosch also unveiled an Alexa-style virtual assistant that responds to spoken commands as well as a “human-machine interface concept” of an in-car cockpit at CES. That cockpit prioritized important data like alerts and warnings to put in drivers’ peripheral vision, and used haptic feedback to let drivers know they’ve pressed a button on a big screen.